Go to System -> Customer Care -> Self-service settings. Click "Default" profile (or create preferred profile) and then click "Shopping Cart" tab. Success URL: Once the the order was placed and payment succeeded, user will be redirected to the URL specified here with below parameters. Express Checkout: This option will work only for "Buy Now" buttons. If this option is "Enabled" then end user will be redirected to Login/Signup page when they click "Buy Now" button. Intermediate page to display cart items will be skipped. Username option: You can choose whether user should enter separate username or use email as username on Signup. 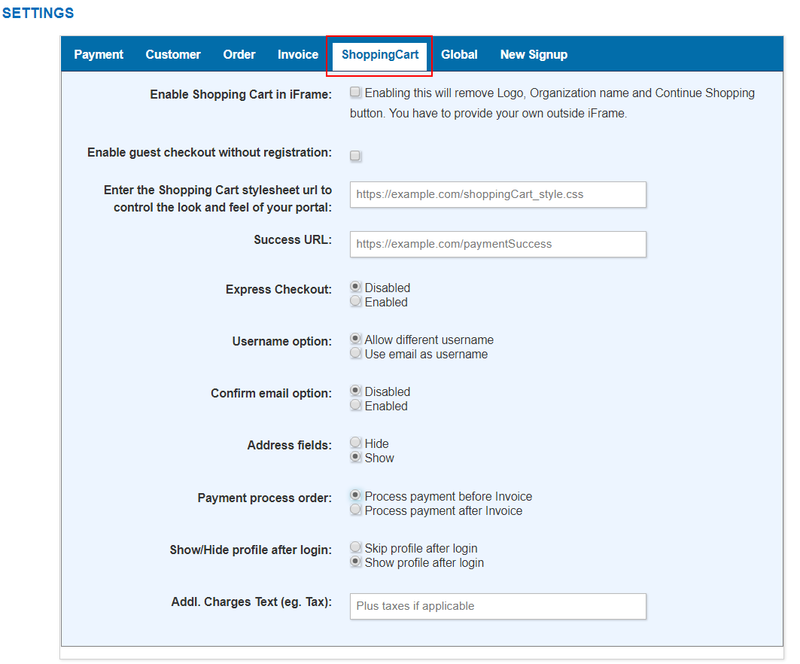 Confirm Email: If enabled, confirm email field will be added in shopping cart signup. Address fields: Address fields in Signup page can be controlled by this setting. Process payment before Invoice: Payment will be processed before creating order. User have to enter payment details at signup. If payment is success then only order and invoice will be created and payment will be applied. Process payment after Invoice: Order and Invoice will be generated first, then payment screen will be shown.